After you purchase your food it is important to remember that, like a loaf of bread, just because it comes in a bag and has an expiration day a year or so long, doesn’t mean it lasts on your home shelf for that long. The expiration is how long the food is good for BEFORE it is opened, while it is still in an oxygen barrier bag. As soon as you open the bag it is exposed to oxygen and begins to degrade. Natural foods do not contain heavy, toxic chemical preservatives and must be treated how you would treat your own food. Do not leave the bag open and exposed to air after opening it. Do not store the food in the sunlight. Do not let the food get wet and if it does get wet, throw it away. Do not keep the food past expiration even if you do not open it. Do not throw the bag away. Even if you store it in an airtight container you MUST keep the batch code. Do not poor in your new food before the old food is COMPLETELY gone unless you poor out the old food and put it ON TOP OF the new food. Do not accidentally let your pet get into the bin and binge eat. 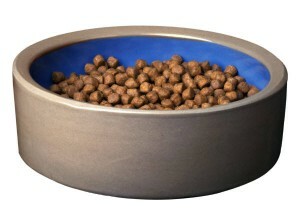 Especially higher quality pet foods are designed with calories packed into every cup so you don’t have to feed as much. A 50lb dog that gets into a food storage bin and free feeds can literally eat as many as 55,000 calories in one binge. That can lead to bloat (which can kill your pet if not noticed within 30-45 minutes and requires a VERY expensive trip to the vet if you do catch it in time), obesity, diarrhea, constipation, and other health problems. Make sure your bin has a secure top to keep out your dog, other animals, insects and mice. Also make sure it is stored in a secure location such as on a shelf or in a room with a door that closes on it’s own (especially in homes with young children). Feed the food within 30-45 days of opening the bag. Throw away what you don’t use by that time. KEEP THE BAG (which includes the barcode, expiration date and batch code). Store the food in a cool and dry place. Rinse the container between EVERY use (oils that have perforated your container eventually go rancid and contaminate new food). If the bag of food you purchase doesn’t fit in your container, then line the food bin with an airtight bag. Pour in what WILL fit and keep the rest either in its original bag, tightly sealed in a cool, dry place until it will fit in the bin. OR (better yet) put the remainder of the food in zip lock bags in your freezer; remove them as needed (making sure to cut the barcode, batch code and expiration date off the original bag and tape it onto a storage bag). OR purchase smaller bags (you may spend more per pound but you spend less at the vet because the health effects of eating rancid food are not good). Contact Chelsea if you have questions about food or food handling. More articles you might enjoy: Dog and Cat Food Labels: Marketing Tricks That Cost You Money by pet nutrition expert Dr. Jean Hofve’s, my Dog Food: 10 Scary Truths and my webpage: Dog Food: What to Feed and Why. Sign up to receive our posts by e-mail or RSS feed. Stay tuned for our article Dry Dog Food Dangers, and learn why you should rethink feeding kibble! This is a great share. Always think to feed my dog with the healthy food. The best solution is an airtight dry dog food storage dispenser, in which you empty one full bag of dog food at a time and keep it sealed until it is time for a refill. Thus limiting oxidation. Oxidation gradually causes fat/oil rancidity and ingestion of rancid oils may imbalance the dog’s immune system and cause allergies, skin problems and many other diseases including cancer. Look into the recently introduced Pet Silo. Such a great article – something we don’t often think about but people like me with several dogs who buys the largest bag of Natural Balance kibble need to know how to store it safely. Only the healthiest, safest food and treats are the ones we buy – our dogs eat better than us but we love them so much – they deserve the best!